Just less than two weeks ago - The Weeknd released the new video to his single 'Twenty Eight' off his 'Trilogy' album. 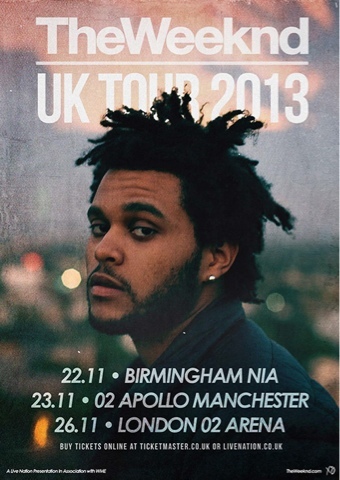 The Weeknd hasn't even done his UK March tour yet - which is already sold out and now the 22-year-old musician has just announced another UK tour in November. Hitting Birmingham, Manchester and London on this three-day-tour. The Weeknd who goes by the real name Abel Tasefaye will be headlining his own arena tour this November - with up to 10,000 fans or more per concert. Tour dates and info on tickets below. Pre-sale tickets go on sale at 9am on Wednesday 27th February via Ticketmaster, 48 hours before the tickets go on general sale on Friday 1st March @ 9am, also via Ticketmaster.